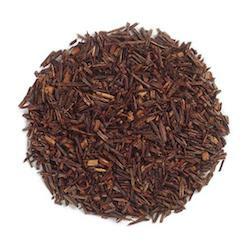 Rooibos Tea is made from the leaves of a bush in the legume family. Its name translated means red bush. Rooibos leaves are shredded, bruised and left in piles to oxidize and then they are sun dried. Rooiboss then turns a deep mahogany red that brews into a naturally sweet, somewhat nutty flavored tea. Rooibos tea is high in antioxidants, low in tannins and is caffeine free. In South Africa, Rooibos is traditionally used to counteract allergies, asthma, colic in infants, digestive complaints, nervous tension and skin ailments. Red Rooibos is warming in thermal nature. Suggested Use: To brew, pour 6 ounces of hot water over one teaspoon of tea. Steep 3-5 minutes, strain and serve immediately.